Today I am going to be all up in your face! When I was growing up, I had nice, full, bushy eyebrows. Not quite Brooke Sheilds bushy but really full and the kind that have to be plucked often to ward off the dreaded uni-brow. As the years went by, I found that my eyebrows stopped growing and plucking was not needed as much. My eyebrows really thinned out and my once full brows became sadly sparse. That’s right. Once you accept the fact that yes, you need to do something about your eyebrows, making a few tweaks will take years off your face. We already know that our hair will thin out as we age, this is, unfortunately, true for both men and women. Sometimes, we get lucky and have to deal with our brows betraying us, too. Yeah. This picture is hard to look at. 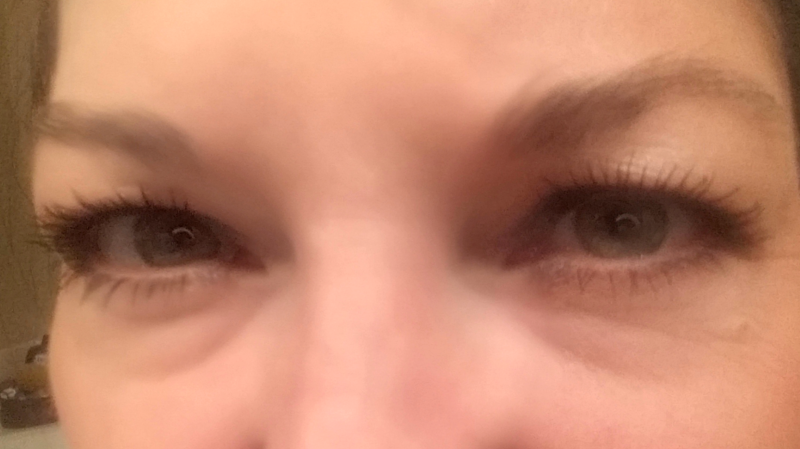 I have put my makeup on (ABB – all but brows) but I look tired and washed out. There’s nothing stunning or dramatic about this look. On my makeup hobby page (click here), I have included a makeup do’s and dont’s video of Lauren Curtis. She shows you how to apply makeup while covering mistakes and tips to create a more beautiful you. Jump to 6:38 and watch the eyebrow portion. She’s young but discusses the importance of caring for your brows. I absolutely agree. Do you? On my search to find a good eyebrow product, I bought and bought and bought and had a difficult time finding the right product/tool. I am embarrassed to tell you that this picture below is just a small sample of the many (oh so many) products that I bought. Some cream, some powder, some pencils. Finding a solution was no easy fix. Just like with most makeup products, you don’t get to try them at the store before making the investment. And I do mean investment. I have shelled out the dough in this search. 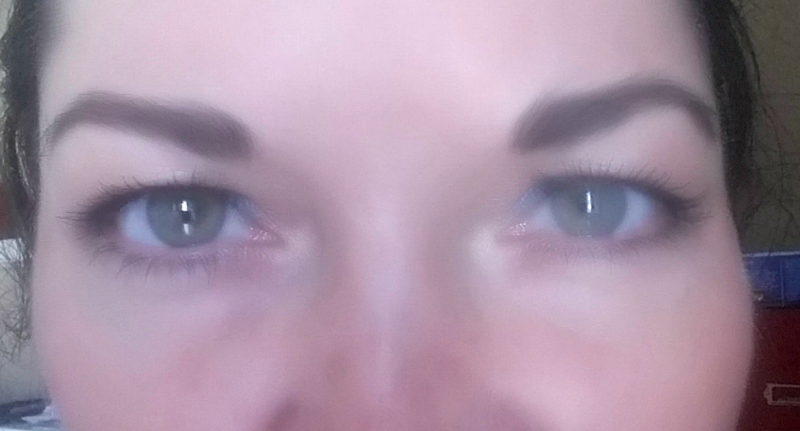 It took some experimenting but I finally landed on the right color and brow tool to create the look I really like. 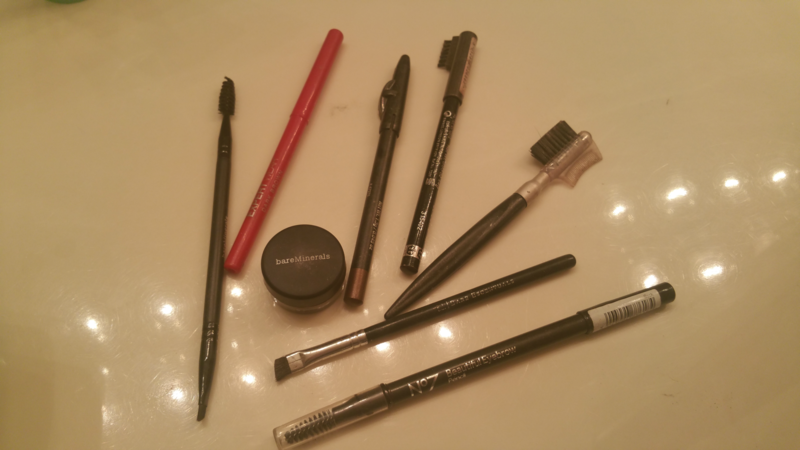 The products I chose were Bare Minerals Brunette (there are 5 shades to choose from) and the Brow Brush Brow Master. 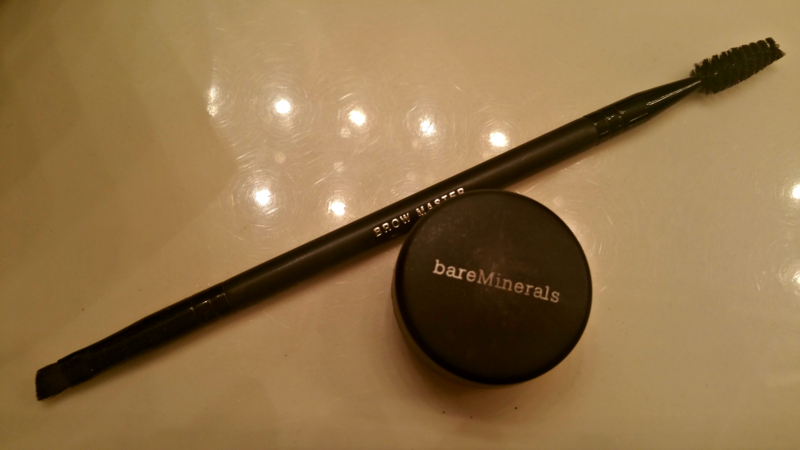 After trying about 10 different brands, I have to recommend the Bare Minerals eyebrow powder and brow master brush as far superior than all others. Before you put any product on your brows, use the brow brush end and comb your eyebrows up. This will help shape your brow and also release any dry skin that has been hiding. Then use the slanted edge of the brow master brush. Dip it in the powder and shake any excess off by tapping on the side of the small round container. It’s really easy to stay in the lines using the slanted edge. You may need to use a cotton swab to pick up any powder that landed where you don’t want it. 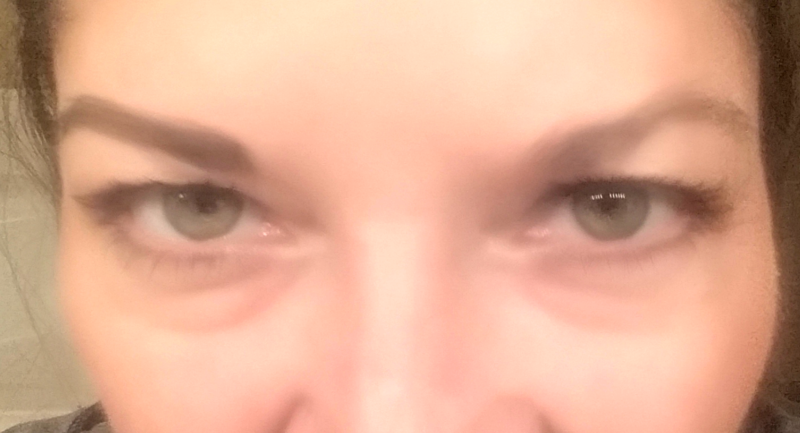 See example below where I added the powder to the brow on your left. Oh yeah! Repeat and then prepare to be amazed at your “AFTER” shot. You cannot deny just how one small beauty tip can change your look and make you look younger. So, join me friends, in making your world a little more beautiful. Also, if you haven’t made this part of your beauty routine and you decide that it’s time, you will be very surprised when you run into others that don’t take care of their brows. Where have they all been hiding? Why hadn’t you noticed before? Just like putting the cherry on top of the sundae. It makes your look complete. Of course, you can conduct your own search and spend a whole lotta money on these products OR you could take my recommendation and get the Bare Minerals products above and get your brows on and start looking younger today! So what do you say? 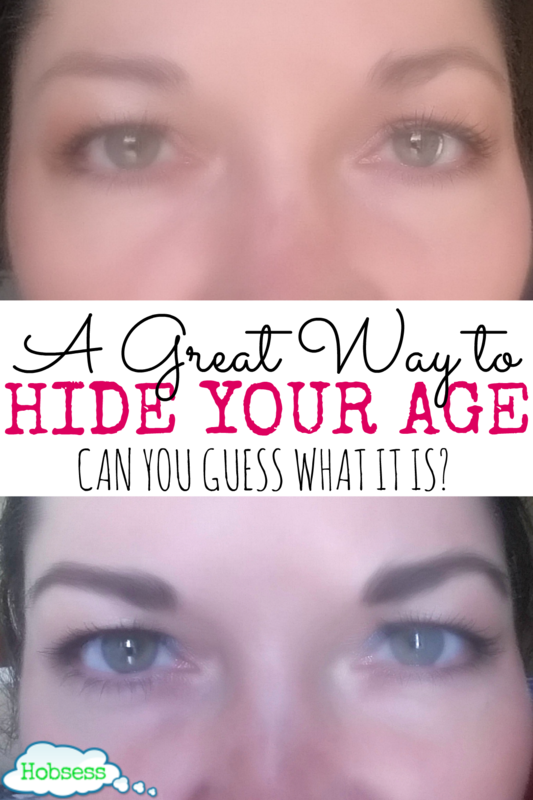 Are you ready to start hiding your age? UPDATE: And now it has been confirmed just how important your brows are according to science, yes science. Click here to read. 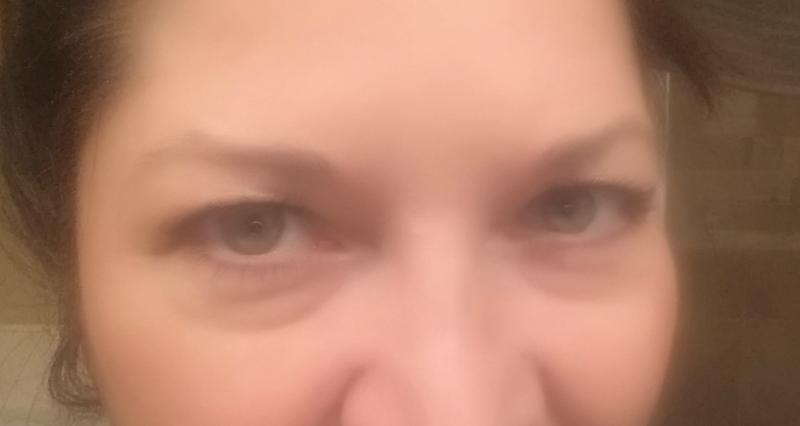 Brows thinning, especially at the ends is a classic sign of thyroid disease! Sadly common in midlife women. Ladies, get your blood work done by an accomplished doctor who knows how to treat this. Well, thank you very much for that info, Carie! So glad you stopped by. I have just started noticing that my eye brows are starting to thin out so I might need this trick sooner rather than later. I don’t think you can start too soon. Even the 20 year old in the video agreed! Thanks Michele for stopping by. Hi Sue! It really does make a big difference doesn’t it? So glad you stopped by. Right? Simple trick but makes a dramatic difference. Ah, the joys of aging! You look beUtiful hon! Love you! Always fantastic to get validation from my extremely young looking mother!